So, you like Pokémon? Are you looking to learn how to draw or to improve your drawing? 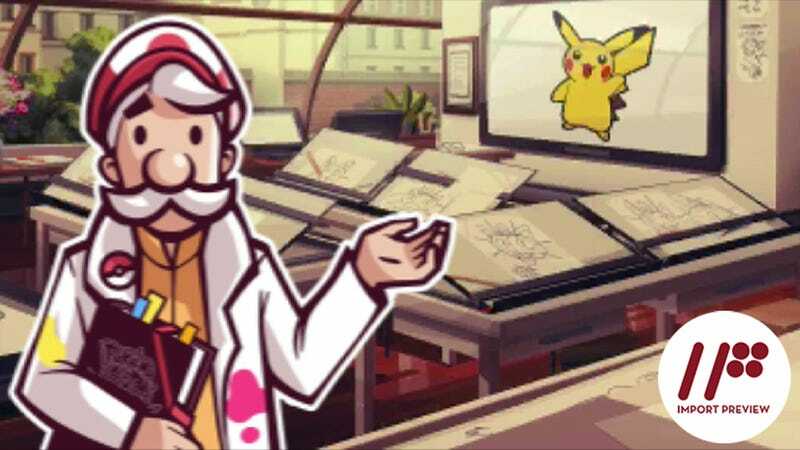 Well, Pokémon Art Academy can help you with that—as long as you're drawing on the 3DS anyway. It is no secret that I am just abysmal at drawing. In truth, I'm barely competent at stick figures, so I wondered how Pokémon Art Academy would deal with someone as hopelessly inept as me. The answer is quite well, actually. It started with the most basic of basics: coloring within the lines. Next I had to trace the lines and then color. After that I had to ink different thicknesses of lines. By the time I finished the “beginners course,” all I was given to start were some rudimentary shapes. Of course, the game still did more than a little hand-holding—for which I am grateful. Each step, it would show me on the top screen what my goal was, always keeping me on track. All in all, it felt like the perfect difficulty curve. I was always learning something new and practicing what I had learned before. Without a doubt, the character Lilly is the single greatest thing about Pokémon Art Academy—and this is in no way hyperbole. Lilly is the first person you meet at the art academy and she does all the same classes alongside you. Also, she is terrible. Terrible like getting a three-year-old to draw Pokémon with their feet terrible. At the start of the game, she can't even trace a picture—hell, she can't even color within the lines properly. In other words, she is the perfect companion. Like I have already stated, I am in no way good at drawing. I have never met a person over the age of seven that is half as bad as me. But Lilly? Lilly makes me look like Leonardo da Vinci. And make no mistake, that is her role. No matter how bad you are—even if your art, like mine, is specifically listed as a war crime in the Geneva Convention—Lilly is worse. Lilly is simply in the game to boost your artistic self-esteem. When you look at the teacher's example and compare it to your own work, you inevitably feel let down. But then you look at Lilly's version and start to think you may be pretty damn good at this whole art thing after all. Pokémon Art Academy teaches you how to draw many of the most popular Pokémon of the franchise—and often in poses different from their pokédex portraits. However, its 40 lessons and around 100 reference drawings hardly make more than a dent in the 719 Pokémon currently out there. Sure their starters are there and so is Pikachu; but if you want to draw a really obscure Pokémon, you're simply out of luck. Luckily, the game's free paint mode does allow you to use the 3DS camera to take pictures for reference images; so really, with a bit of work, you can try your hand at any Pokémon if you can take a picture of it—as well as upload your drawings to the Miiverse. In my week and a half of playing Pokémon Art Academy, I have drawn more than a few damn good looking pictures on my 3DS. Sadly, that skill hasn't transferred all that much to drawing outside the game on a sketch pad. Basically, while there is a noticeable improvement, the difference between my sketch pad and 3DS picture quality is pretty sizable—and it’s easy to see why. The game makes undoing your last action as easy as touching a shoulder button. Thus, I could redraw the same line a dozen times in as many seconds—trying again and again till I got the perfect line. On paper, the process is hardly as clean or as easy. However, if I were to use a computer connected drawing pad with its own easy undo feature, I suspect that my free hand drawings would look much improved after playing this game. When I draw or write, I like to rest my hand on the table to the right of where I am writing. However, I had problems doing this in Pokémon Art Academy. If I was careless, my cramped hand would push the 3DS's face buttons. This was aggravating, especially if it would happen as I was in mid-line, thus interrupting my drawing. Moreover, when I would occasionally turn the 3DS to get a better angle on what I was trying to draw, I would have no support for my hand at all which was also annoying. Lastly, as the touchscreen does not know how to interpret multiple touches, my hand touching the screen while drawing would cause the pointer to jump across the screen, leaving a jagged line in its wake. Not deal breaking, but more than a bit exasperating every time it happened. Do you like Pokémon and want to learn/get better at drawing? Then this game is exactly what you are looking for. It teaches you step-by-step how to draw and has a great difficulty curve as it introduces you to more and more techniques. However, don't expect to get good at drawing overnight or anything. Most of the skills you learn are much harder to implement in the real world. Still, if you ever need an artistic ego-boost, this is the game for you. Pokémon Art Academy was released in Japan for the Nintendo 3DS on June 19, 2014. It was released in Europe on July 4, 2014; Australia and New Zealand on July 5, 2014; and will be released in North America sometime this October.